Langdale in the Lake District is the collective name for Great Langdale and Little Langdale which are separated by Lingmoor Fell. Great Langdale is best known for the Langdale Pikes which are a group of peaks on the northern side of the dale. The area is popular with hikers, climbers and fell runners who are attracted to the many fells at the head of the valley and Scafell Pike, which is England’s highest mountain, can also be climbed from here. The valley is U-shaped formed by glaciers and its mouth is located at Skelwith Bridge. The valley houses two villages Chapel Stile and Elterwater and these were the centres of the Lakeland slate industry. The workings at Elterwater Quarry and Spout Cragg Quarry are still working now using modern methods and both are operated by the Burlington Stone Company but many other mines have now fallen into disuse. Little Langdale valley is a hanging valley and has been heavily mined for copper and slate for the last few hundred years but today only the evidence remains. Little Langdale was in earlier days at the intersection of packhorse routes and Slaters Bridge which crosses the River Brathay at Little Langdale Tarn is a fine example. The bridge built of slate is of 17th century and crosses the river in three spans supported by a large mid stream boulder and stone causeways. Little Langdale Tarn which is a natural tarn set in a marshy area of the valley was several times larger at the end of the last ice age. The tarn, which has no public access, and a large area around the tarn has been designated an SSSI and is managed by the National Trust who also maintains many of the scattered farms in the valley. Little Langdale village is a small hamlet consisting of a few stone houses and a pub, the Three Shires Inn it was named this because it was only two miles from where each of three old boundaries of the counties of Cumberland, Lancashire and Westmorland met. Lingmoor Fell even though surrounded by higher and more popular fells stands on its own with no connecting ridges and separates Great Langdale from Little Langdale. The fell can be climbed either from Elterwater in Great Langdale or from the Blea Tarn car park in Little Langdale. The summit at 469 metres (1539 feet), named Brown How, throws out wonderful views of the Langdale Pikes, the high fells around the head of Great Langdale and to the south west the Coniston Fells. The high dry stone wall which crosses over the summit travels along the spine of Lingmoor Fell from its eastern foot to finish at the crags below Side Pike in the west. 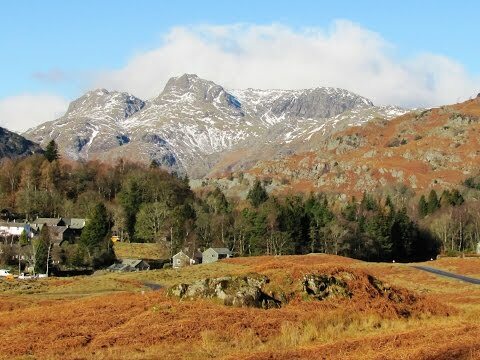 Lingmoor Fell’s northern and eastern flanks above the villages of Elterwater and Chapel Stile are covered in deciduous woodland and have long been quarried for its high quality Westmorland green slate. The Burlington quarry at Elterwater has been worked for over 300 years and is still in production turning out 800 tonnes of slate annually. Many of the quarries have closed over the years and the crags are now used by rock climbers. The detached rock pinnacle of Oak Howe Needle, 1km from the summit, part of Oak Howe Crag has over ten routes on Rhyolite crags also popular with rock climbers. To the north-west Lingmoor Fell has a subsidiary top known as Side Pike, at 363 metres (1187 feet) it has a sheer rock face which is not accessible by the walker. Elterwater the lake, situated at the entrance of Great Langdale, is the smallest of sixteen lakes being only half a mile long. The lake is fed by water from both Great Langdale and Little Langdale and the River Brathay provides the outflow from the lake. Elterwater means Swan Lake, Elter being the Norse word for swan and the lake is a haven for a large variety of wildlife especially the swans that migrate to the lake in the winter. Elterwater the village which was a farming and quarrying community now depends on tourism because only a quarter of its houses are permanently occupied the rest are holiday cottages, there is also a youth hostel and the Britannia Inn which is a former 17th century farmhouse. The village first prospered with the quarrying of slate at Kirkstone Green. In 1824 a gunpowder manufacturing business brought workers to Elterwater. Coppiced juniper wood was turned into charcoal, saltpetre was imported to Windermere by train and then transported to the village and sulphur was also imported. These three ingredients were mixed and ground to produce the gunpowder and six water wheels turned by the River Brathay provided an economic means of power. Production ceased in the early 1930’s and today the building is a holiday complex. Chapel Stile is a small village located at the foot of Great Langdale on the banks of the River Brathay and is quite distinctive with its 19th century green slate houses which were built to house the quarrymen. During the same period a gunpowder works was also established to supply the slate quarry mines. The village church, built in 1857, sits on the hillside overlooking the village and has a few interesting stained glass windows. We walk into the centre of Elterwater and follow the Coniston and Little Langdale sign over the bridge. We head up the road until we reach the Elterwater Inn and turn right along the tarmac track. We pass Elterwater hall and keep heading forwards following the sign for Little Langdale 1 mile. We start heading uphill through the trees and when we reach a gate we go through and keep heading forwards following the track. After leaving the trees we pass a solar pillar on the right we go through the gate on the right and bear half left across the field through the second gate. We keep heading uphill to go through a third gate then turn right and follow the path zigzagging uphill with the wall on our right. At the second cairn we head forwards, leaving the main path, to a wall. We now turn left and follow the wall uphill to rejoin the main path. We keep following the wall uphill towards the summit of Lingmoor Fell the wall becomes a fence. At the stile in the fence we cross over and turn left following the path between the fence on our left and a cairn on the right. We start to go downhill and when the fence turns sharp left we turn left still downhill. We then follow the path close to the wall until we reach a stile. We turn left over the stile and follow the wall on our right until we reach the cliff face of Side Pike. We turn left downhill towards the road and then take the path on the right through the field which runs parallel to the road. When the road turns sharp left we keep heading forwards on the path. Just before the tree line we turn right along the path heading towards the stream. We cross over a ladder stile a keep heading forwards on the Cumbria Way. We take the track between two walls marked with a yellow arrow. At the junction of paths next to a building we bear left following the sign for Great Langdale 1¼ miles. We keep follow the track passing a large wooden bridge over Great Langdale Beck on our left sign posted Chapel Stile 1 mile. We go through a gate and keep heading towards a farm with the beck on our left. We cross over a stone bridge and follow the sign to the village centre. We come to the road opposite the public toilets and turn right. Immediately after passing Wainwright’s Inn we turn right following the sign Elterwater ½ mile. We go over a bridge and head forwards following the track with the beck on our left and spoil heaps on our right. At the t-junction we turn left onto a tarmac track. At the bridge we cross over, turn left and make our way through Elterwater back to our car. This is a moderate walk on good paths and tracks with some minor road. Approx 7.2 miles allow 3.5 – 4 hours using OS Explorer Map’s OL6 & OL7. The English Lakes: – South-western area and South-eastern area. Start point: Road side on the edge of Elterwater village. Elterwarter is in the Langdales in the Lake District, Cumbria. From the A66 take the A591 Keswick to Windermere road. At Ambleside follow the Coniston signs (one way system) onto the A593. At Skelwith Bridge turn right onto the B5343 sign posted Elterwater. Parking: Free road and lay-by parking on the edge of the village and the pay and display car park in the village centre. There are public toilets at Elterwater near the car park and bridge and also at Chapel Stile which are open from Easter to October. For refreshments in Elterwater there is the Britannia Inn and the Elterwater Inn. In Chapel Stile there is the Wainwright’s Inn, Brambles Cafe and Langdale Co- operative village store. Nearby in Little Langdale village there is the Three Shires Inn and at Skelwith Bridge there is the Skelwith Bridge Hotel and Chesters shop, bakery and cafe.